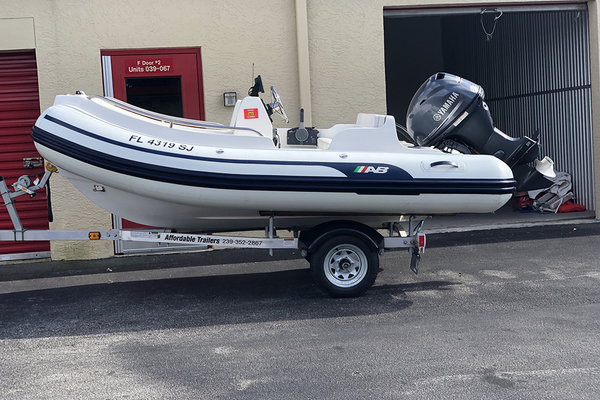 Brand new 2018 Novurania 430DL rigid inflatable yacht tender priced with 60hp Yamaha fuel injected four stroke outboard. Creme Hypalon tubes with the option of Gray or Navy accents. Other features on this Novurania included: Navigational lights, automatic bilge pump, 3 lifting eyes (3 point lift system) courtesy deck lights, four circuit switch panel, molded-in fiberglass console with no feedback steering system, molded-in helm seat with cushioned backrest and lots of storage underneath, molded-in bow storage compartment/anchor locker with cushion, battery cut-off switch, battery maintainer and transom tie downs installed.